Figure 1 RF ablation monitored with US. (A) An exophytic renal tumor (arrows) was targeted under US guidance. The dotted line is the biopsy guide, indicating the predicted path for the RF probe. (B) When monitored by US, gas bubbles form around the probe, obscuring the area with ''dirty shadowing.'' The bubbles do resolve over time, but complicate subsequent targeting, making the sequence of probe positioning very important. Abbreviations: RF, radiofrequency; US, ultrasound. 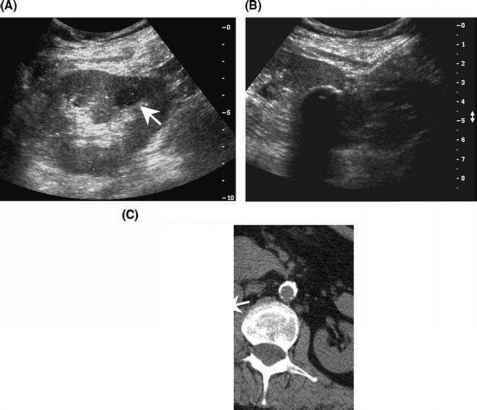 Figure 2 Cryoablation monitored with ultrasound US and CT. (A) A new hypoechoic renal tumor (arrow) was identified in a transplant kidney. (B) The tumor was targeted and ablated under US guidance. The leading edge of the ice ball is identified as a hyperechoic interface with dense posterior acoustic shadowing. (C) In a different patient, the ice ball is identified on CT as a zone of low attenuation (0 Hounsfield units). It is easy to distinguish the line of demarcation between the ice ball and unaffected tissues (arrows). Abbreviations: CT, computed tomography; US, ultrasound. the ablation size associated with a particular applicator is important to ensuring complete ablation and avoiding inadvertent damage to surrounding structures. Figure 3 ''Tumor ghost'' after RF ablation of a RCC. 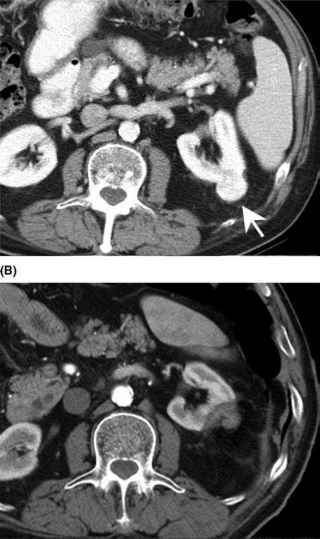 (A) An exophytic RCC (arrow) was identified incidentally on a CT scan performed for other reasons. The tumor was subsequently targeted and ablated with RF, using a combination of US and CT guidance. (B) A diagnostic contrast enhanced CT performed immediately after the ablation shows the ''tumor ghost.'' 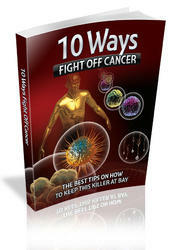 The tumor often does decrease in size, likely secondary to dessication, but will not resolve. More importantly, there is no residual enhancement of the tumor itself, and the lack of adjacent renal enhancement shows there is an adequate margin. Abbreviations: CT, computed tomography; RCC, renal cell carcinoma; RF, radiofrequency; US, ultrasound. Figure 4 Tumor regression after ablation. (A) A contrast-enhanced T1-weighted image obtained one month after ablation of an RCC identifies the tumor and shows some subtle smooth peripheral enhancement (arrow). This kind of enhancement is often seen in the immediate postablation period and is not necessarily concerning. (B) Follow-up imaging six months later shows that the peripheral enhancement has resolved and the tumor mass has almost entirely resorbed (arrow), indicating complete ablation. Abbreviation: RCC, renal cell carcinoma. do not have access to the tumor after treatment, tumors treated with heat-based modalities are slow to resorb, sometimes taking more than 24 months to completely resorb. Thus, the first several CT scans obtained after ablation with heat-based modalities should be primarily focused on evaluating for residual tumor enhancement.